Joseph Bellows Gallery is pleased to announce the first exhibition in California of the East Coast lens-based practitioner, Ellen Carey. Her iconic and breakthrough work in Polaroid known as Pulls, under her umbrella concept Photography Degree Zero (1996-2012) will be highlighted with her equally compelling innovations in color with Polaroid. The prescient Polaroid phrase See What Develops could be a metaphor for Carey’s long history with this instant photographic technology. 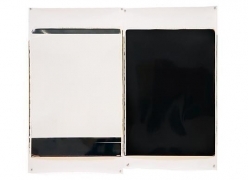 Abstraction in photography and lens-based art presents a contradiction in terms, and Minimalism is a further oxymoron. Well developed in the 20th century in other areas — Abstract Expressionism, Minimal and Conceptual Art — abstraction and minimalism is still emergent twelve years into the 21st century. It is here, in the early stages of modern and contemporary art with roots in photography, that Carey’s work has a context. These practices are largely based in America and the tenets of their legacy are incorporated into her art practice. The American invention of Polaroid 20x24 camera/film complements these advances in visual thinking with her discovery of the Pull in 1996. 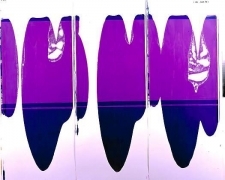 Carey has chartered and mastered a path beyond the short and varied history of — Color, Polaroid, Abstraction, Minimalism—in lens-based, photo-art. To move forward, to dig deeper into color’s mother lode, she journeyed through uncharted territories along a path full of discoveries and surprises, with new possibilities and arrangements, finding the need to rely on traditional photographic colors faded away. They were displaced by imagined, chemically created colors, using light or no light, the zero of her practice. 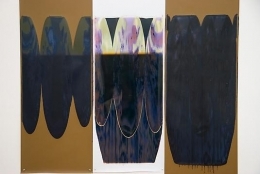 Ellen Carey has mixed and mismatched conventional practices with experimental abandon. Her menu of inventive techniques brings to life colors and combinations never before seen. 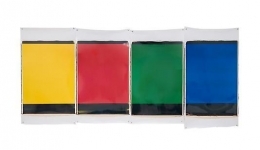 Her primary tool of choice for creative expression is the 20th century large format Polaroid 20x24 camera, used by this artist for close to three decades; it has become synonymous with contemporary art. Like paint tubes, Carey uses light, in all its forms, as a common denominator. 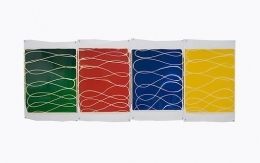 Partnering light and color reflects her creative endeavors and artistic interests in a medium well known and highly regarded for its technical advances, enriching the visual arts and broadening the parameters of our picture culture. Her artworks bring a unique and compelling range of form and hue, high impact compositions in tandem with inventive methods of expression. She has also introduced a new form to the medium, the conical, black loop of her Pull, known as a parabola. 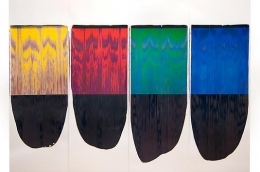 New colors often take their cue, in content and context, from the formula and its palette of photographic color theory: R/G/B=Y/M/C, resulting in bold innovation and experiment, that are also visceral and physical. The large unique Polaroid prints of this exhibition find their compositions located in chance and skill, from the fast-paced process of moving light and film to the random and deliberate zero of her exposures, yielding spectral variety, free-wheeling new forms and feelings. 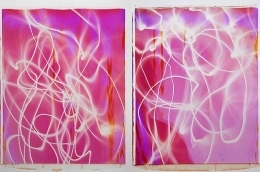 Light first traces, its “prima facie”, are fluid in the artist’s hand, as the 19th century phrase drawing with light, a reference to the dawn of photography, is revisited here by Ellen Carey, with Polaroid, in the 21st century. 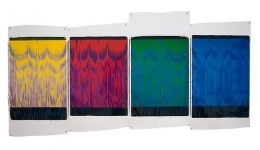 Ellen Carey (b.1952 USA) is an internationally/nationally recognized photo-based artist, whose work uses the large Polaroid 20x24 camera (one of five) to create her well-known Pulls and site-specific installations. Her work is in the permanent collections of over twenty major photography and art museums including The Albright-Knox Art Gallery, George Eastman House, Museum at the Chicago Art Institute, Fogg Museum at Harvard University, Los Angeles County Museum of Art, Metropolitan Museum of Art, New Britain Museum of American Art, The Smithsonian, Whitney Museum of Art, Wadsworth Atheneum and Yale University Art Gallery; Books include The Polaroid Collections (Taschen), A Century of Colour: From the Autochrome to Digital by (former) Victoria & Albert Museum curator, Pamela Roberts (Carlton Books, Ltd, London) and The Edge of Vision: The Rise of Abstraction in Photography by Lyle Rexer, an independent curator/critic, for Aperture Foundation (www.aperture.org), a group exhibit/tour (2009-2013); he states: “Ellen Carey is among this country's most committed experimental photographers." Considered a pioneer in the cameraless photogram and lens-based Polaroid photographic and contemporary art field, Carey is also an independent scholar, writing under her practice Pictus & Writ in the tradition of artist-on-artist. Her first essay Color Me Real was published (Yale University Press) in the catalogue for the drawing retrospective of Sol LeWitt titled 100 Views for MASS MoCA (2008). Aperture (#204) recently published Carey's essay on her discovery of Man Ray's "hidden" signature in his "Space Writing" self-portrait (1935).